Okay, you've seen the kitchen (it's still a work in progress). Let's move on to the dining room. Really, I'm not sure what that room is. It's too small to truly be a dining room, yet the ugly light fixture hanging from the ceiling suggests to me that it is, in fact, a dining room. Since we moved from a small apartment, we didn't (and still don't) have dining room furniture. As it is, our kitchen table is a hand-me-down from a friend. (Thanks, Kathy!) Where was I? Oh, right. Lack of dining room furniture. Since we don't have a dining room set, we haven't fully decided what to do with that little room. Mostly, it's used for Grace's toys. But someday, like after we get her playroom finished (or started for that matter), I'd like to either use it as a sitting area with a couple of cozy chairs and a little table to hold books. A nice relaxing place to sit and read while sipping a cup of tea. Anyway, last year, I when picking out paint colors, I had such a difficult time choosing a color for the living room, dining room and the two hallways. I loved the color I chose for the kitchen. Since our house is small, I decided to just use that color throughout the main rooms of the house. At least for a while. Anything to get those dirty, ugly walls painted! Just before Grace's 1st Birthday, my Dad came over to paint. 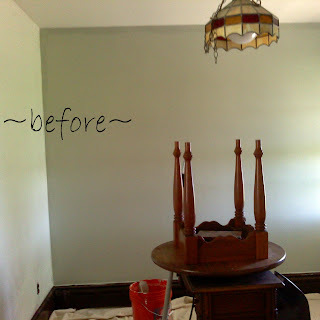 Joe had already done the kitchen walls, so Dad painted the living room, dining room and halls. My brother also stopped by and painted the ceiling. Here's a picture I snapped after my Dad painted the walls in the dining room. Don't mind the mess. Dad still had more painting to do, so we piled the furniture up and moved it to the center of the rooms until Dad was finished. 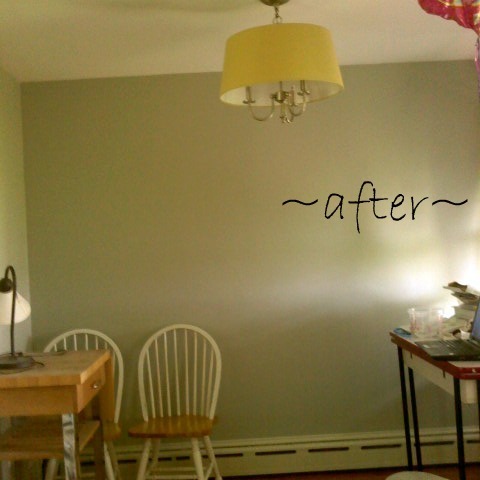 A year later, the trim still wasn't painted. Joe was supposed to do it, but after working 60+ hours a week, who wants to come home and paint?! I didn't bother to do it myself since, I couldn't imagine me being able to paint when I can barely find the time to shower or go to the bathroom withoug Grace following me! But I couldn't stand it any longer! The dark woodwork was making me crazy! And making me second guess my choice in wall color. So, in March (or maybe it was April), I started painting the trim in the house after Grace went to bed. I started with this room first since it's the smallest. I love the light and airy look of the room now! It has a bit of a coastal feel to me. That's not really the look I was going for, but in the end, I really love it!